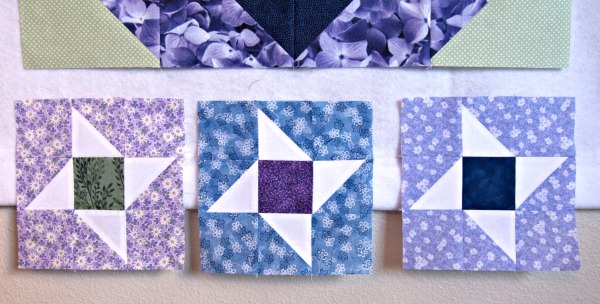 This past week's lesson in the Accuracy Quilt Along seemed straightforward and easy. Who knew that I'd have to redo it 3 times before I was happy with it. We've only got a few more lessons before we finish the quilt top and it's getting trickier to balance out the fabric selections. The quilt pattern actually calls for 24 fat quarters (about 6 yards) of coordinating fabric plus 3 yards of contrast fabric (white in my case). Since I didn't buy a specific fat quarter bundle, I opted for some yardage in my stash. I also didn't choose 24 different prints. I have half that many: 6 blues, 6 purples, and only 2 greens (I might have to mix in a 3rd for some of the small border blocks, I'm not sure yet). The limited palate has definitely made this more challenging. This lesson consisted of 3 friendship star blocks, which I called throwing stars because they remind me of ninja stars. Here was my first attempt. I liked the 3 different colors for the center block but the middle violet fabric had too much white and you couldn't see the star very well. My final redo involved swapping out the green center for a navy blue center. That balanced out the 2 outside stars and highlighted the deep purple on the center star. Whew! Now to add the white sashing in between and I can get on with lesson #12 now.